Utah Royals FC and the Orlando Pride tied 1-1 on Saturday night to open their NWSL seasons in front of a crowd of 9,017 fans at Orlando City Stadium. For Utah, it’s their first-ever NWSL point. It didn’t take long for Utah Royals FC to score their first NWSL goal. In just the third minute, Diana Matheson, playing in her first game since the 2016 NWSL Championship, sent a long cross into the box. Gunnhildur Jónsdóttir, making her NWSL debut, slid to get her right foot on it and knocked it past Pride goalkeeper Ashlyn Harris to give Utah the 1-0 lead. Matheson missed all of last season after tearing her ACL last January. Orlando tied the game in the 21st minute on a penalty kick from Marta, her first of the year after scoring 13 last season. The Pride earned the first-half penalty on a controversial call by referee Danielle Chesky. Orlando sent a ball into the box towards Pride midfielder Dani Weatherholt. 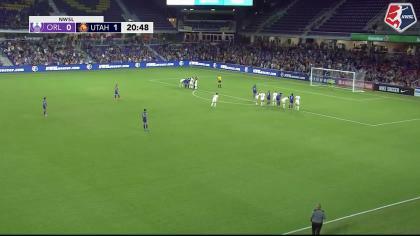 Weatherholt hit the ball with her right foot and the ball then appeared to hit Utah Royals FC defender Becky Sauerbrunn in the face. But Chesky called for a penalty kick and awarded a yellow card to Sauerbrunn, whose arms appeared to be raised when the ball came off Weatherholt’s foot. In written responses to questions from Luis G. Hernandez, the referee pool reporter in Orlando, Chesky said that she determined Sauerbrunn to have deliberately handled the ball. Chesky also wrote that Sauerbrunn was awarded the yellow card for deliberately handling a shot on a goal. In the 45th minute, Pride forward Alex Morgan went down after a hard head-to-head collision with Utah Royals FC Abby Smith. Morgan walked off the field, but did not return and was replaced by Chioma Ubogagu to start the second half. The Pride said after the game that she is being evaluated per the league’s concussion protocol. The game was Sydney Leroux‘s first game with Orlando. Her best chance on goal came on a header in the 49th minute, but her effort was collected by Smith. Both teams had limited chances in the second half, but Jónsdóttir nearly won the game for Utah deep into second half stoppage time, sending a screaming shot just over the crossbar. 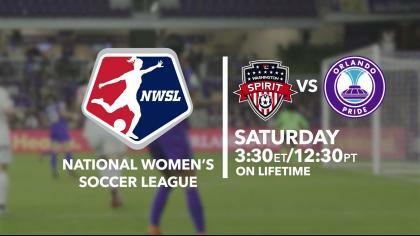 Match ends, Orlando Pride 1, Utah Royals 1. Second Half ends, Orlando Pride 1, Utah Royals 1. Attempt missed. Gunnhildur Yrsa Jonsdottir (Utah Royals) right footed shot from outside the box is too high. Assisted by Rachel Corsie following a corner. Corner, Utah Royals. Conceded by Rachel Hill. Ali Krieger (Orlando Pride) is shown the yellow card for a bad foul. Substitution, Utah Royals. Sidney Miramontez replaces Brittany Ratcliffe. Attempt blocked. Christine Nairn (Orlando Pride) left footed shot from outside the box is blocked. Assisted by Sydney Leroux. Attempt blocked. Brittany Ratcliffe (Utah Royals) right footed shot from outside the box is blocked. Assisted by Katie Stengel. Substitution, Orlando Pride. Mônica replaces Poliana. Attempt missed. Katie Stengel (Utah Royals) header from the centre of the box misses to the left. Assisted by Rebecca Moros with a cross. Substitution, Utah Royals. Katie Stengel replaces Elise Thorsnes. Delay in match Elise Thorsnes (Utah Royals) because of an injury. Attempt saved. Sydney Leroux (Orlando Pride) header from the centre of the box is saved in the centre of the goal. Assisted by Shelina Zadorsky. Attempt missed. Rachel Corsie (Utah Royals) right footed shot from the centre of the box misses to the right. Assisted by Gunnhildur Yrsa Jonsdottir with a headed pass. Substitution, Orlando Pride. Chioma Ubogagu replaces Alex Morgan because of an injury. Second Half begins Orlando Pride 1, Utah Royals 1. First Half ends, Orlando Pride 1, Utah Royals 1. Kelley O'Hara (Utah Royals) wins a free kick in the attacking half. 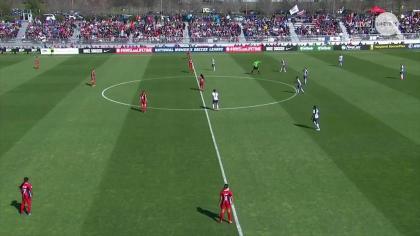 Offside, Orlando Pride. Carson Pickett tries a through ball, but Alex Morgan is caught offside. Attempt blocked. Marta (Orlando Pride) left footed shot from a difficult angle on the left is blocked. Assisted by Sydney Leroux with a cross. Attempt missed. Gunnhildur Yrsa Jonsdottir (Utah Royals) right footed shot from the right side of the box is too high. Attempt saved. Alex Morgan (Orlando Pride) right footed shot from the right side of the box is saved in the centre of the goal. Assisted by Sydney Leroux with a headed pass. Offside, Utah Royals. Desiree Scott tries a through ball, but Brittany Ratcliffe is caught offside. Goal! Orlando Pride 1, Utah Royals 1. Marta (Orlando Pride) converts the penalty with a left footed shot to the bottom right corner. Becky Sauerbrunn (Utah Royals) is shown the yellow card for hand ball. Penalty conceded by Becky Sauerbrunn (Utah Royals) with a hand ball in the penalty area. Attempt blocked. Dani Weatherholt (Orlando Pride) right footed shot from the centre of the box is blocked. Assisted by Carson Pickett with a cross. Attempt missed. Elise Thorsnes (Utah Royals) right footed shot from the right side of the box is too high. Assisted by Gunnhildur Yrsa Jonsdottir with a headed pass. Attempt missed. Ali Krieger (Orlando Pride) left footed shot from the centre of the box is close, but misses the top left corner. Assisted by Marta with a cross following a corner. Corner, Orlando Pride. Conceded by Becky Sauerbrunn. Attempt saved. Kelley O'Hara (Utah Royals) left footed shot from the right side of the box is saved in the bottom right corner. Assisted by Diana Matheson. Goal! Orlando Pride 0, Utah Royals 1. Gunnhildur Yrsa Jonsdottir (Utah Royals) right footed shot from the centre of the box to the bottom right corner. Assisted by Diana Matheson with a cross.